I am delighted to be writing my first blog on my French pronunciation website on one of my favourite dates, when all my compatriots don’t work, as it is always a bank holiday, paradoxically called la fête du travail ! I nostalgically wish to share this wonderful fragrant French tradition with you as it fills every home with a sweet scent, which brings happiness to all! The loving gesture of offering small bunches of Lily of the Valley, called le muguet to friends and family, as a good luck charm, apparently dates back to the Renaissance with Charles IX offering the flower to the ladies of his court. The lure of this herbaceous plant was supposedly recognised by Apollo, when he covered the ground with it, so that his six muses wouldn’t hurt their feet. From 1936 it is associated with the workers’ combat for paid holidays. Since the French revolution it is allowed to be sold by individuals and charities on street corners to any passers-by without having to hold a licence. We gift it to each other as a porte-bonheur (bearer of good luck). More than 50 million bunches are sold in France every year and its production comes mainly from wholesalers in the Nantes region. Sometimes other flowers are tied into un bouquet de muguet. I puristically prefer un brin de muguet, a simple blade with the delicate multiple bells attached, that actually ring and smell divine when you shake them. Like the rose in le Petit Prince, the scent “embaume ma planète”. Unlike culinary traditions, it is difficult for me to reproduce this ritual in England, as the flowering of the lily of the valley rarely coincides with the right date and my plants have been feasted on by different insects and looks sadly bell less and perforated! I am so thrilled and grateful to share with you Hazel McNab’s Muguet Heart today as part of her 1000 heart passion. 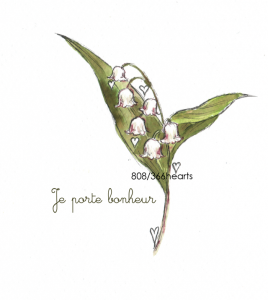 I would like to invite you to discover her inspiring collection on 366hearts, with le muguet especially drawn for this fête to wish you un bon premier mai et beaucoup de bonheur! We would love you to leave us a message and your contact details and as a premier mai present, Hazel and I have made you a little video about the muguet! Bon premier mai! 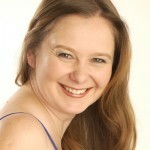 Super blog ! Merci …..
Merci pour ton gentil message Noelia! Je te souhaite beaucoup de muguet ce premier mai!